Der S35 CA ist ein französicher Jagdpanzer der Stufe 5. Entwickelt auf Basis der veralteten Fahrzeuge R35 und S35. Das einfache Design erlaubte, dass ein offener Kampfraum mit einem britischen 17-Pfünder auf dem Chassis aufgebaut werden konnte. Das Projekt wurde jedoch in der Entwicklungsphase aufgegeben, da das veraltete Vorkriegschassis nicht in ausreichender Stückzahl vorhanden und das Geschütz ineffizient und unkonventionell war. Nicknamed as "The Bathtub" due its shape, this tank has a very accurate and good stock gun that is even better than the StuG III's top gun, making it an extremely fun tank to play if you can get past its appearance. 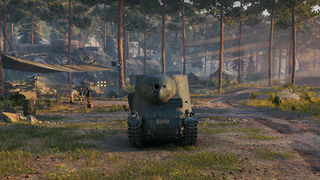 The S 35 CA is able to upgrade by mounting two other great guns, the 105mm that packs a punch and can rip up tanks with ease, and a slightly more accurate and faster firing 90mm gun. 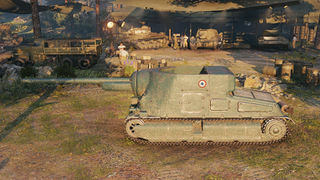 But some people might prefer the 90mm, as it has a higher damage per minute than the hard-hitting 105mm. Players will feel right at home with this TD even on stock values, especially after the grueling Somua SAu 40. The gun traverse is immense and comparable to the Marder II or T40. Der S35 CA führt zum ARL V39. Like most TDs, the S35 CA is best suited for defensive tactics. Its weak armor, slow speed, and tall profile make it completely unsuitable for leading an attack, although it can certainly follow up and support teammates with its powerful gun selection. The tall profile is still a handicap, but it can actually work out favorably for this TD if you know the terrain well. The high mounting of its gun means the S35 CA can fire over obstacles easily. 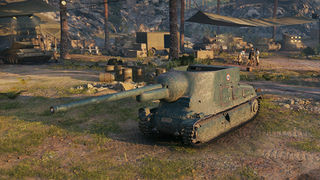 Use this to your advantage; with its good gun depression the S35 CA can pull off a mean hull-down position, sitting behind a rock, hill, or knocked-out tank exposing little more than its mantlet and gun to enemy fire. Since the mantlet is close to 60 mm thick, it is the only part of this TD that has any chance of bouncing shots. This will not make this TD invulnerable though, as some tier V tanks can already penetrate both the mantlet and the armor behind it. A good tactic to practice to increase survivability is to "poke and shoot", retreating behind cover between shots and thereby making yourself a more difficult target to hit. If you can't establish a hull-down position, the best option for this TD is sniping. Its accuracy is good although the aim time is quite long, and all of its guns have plenty of penetration to fire at and damage targets at longer ranges. Always keep a watchful eye out for artillery, or get some cover if you can; the S35 CA will often get one-shot by a decent hit from almost any artillery piece it encounters. Make sure to research at least the 90mm before moving onto the ARL V39 as the 90mm is required to advance to the next tier and carries over to the ARL V39, together with unlocking the very powerful 90mm DCA 45. The top radio and engine carries over from the Somua SAu 40, and should be equipped immediately. The suspension should be researched next, as the stock suspension cannot hold the 90mm and 105mm. Go from there with your gun choices. In 1945, shortly after France was liberated from Nazi occupation, France started the work on a new tank destroyer based on a prewar medium tank Somua S35 chassis. 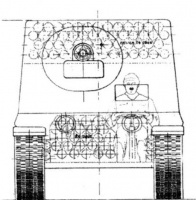 The design was simple, and included a large superstructure on mounted on the front of the vessel. Main armament was suppose to be equivalent to the famous British 17 pounder gun. An ammo rack with a storage capacity of 54 rounds (even up to 86 according to some sources) was to be located in the back of the vehicle. By design, the weight of should be a little bit lower than 22 metric tons. The project was soon canceled, which meant the end of all development even before the first prototype was complete. The S35 CA's only intended armament was the 17-pounder gun. No historical records exist of either the 105 mm AC mle. 1930 S or 90 mm AC canon DCA 30 gun being developed for it.